What causes artists to gather in one location or another? How did Athens in the 4th century BCE become a center of cultural activity? What made Florence so appealing to artists in 15th century Italy? What brought artists to Paris or St. Petersburg in the 19th century, and why did so many artists gravitate to fin de siecle Vienna to sip from the "Sacred Spring"? Was it because of the quality of the light in these locations? The economic opportunity? Pixie dust in the tapwater? Whatever the secret ingredient, it similarly lured hundreds of artists-- mostly cartoonists and illustrators-- to Westport, Connecticut. Westport was an artist's community for much of the 20th century but it became the supernova of American illustration in the "Madmen" era of the 1950s and 60s. Lights blazed all night long in art studios around Westport where some of the hottest and most talented illustrators and cartoonists in the world worked long hours to satisfy the great demand for their art. It was not uncommon for an artist to climb into his (yes, almost always "his") fancy sports car at two in the morning to visit another artist's studio where they drank, compared notes and worked until dawn. Westport became the home of the Famous Artists School where illustrators such as Norman Rockwell, Albert Dorne, Stevan Dohanos, Robert Fawcett, Ben Stahl, Harold Von Schmidt, Al Parker, Austin Briggs, Jon Whitcomb, Peter Helck, Fred Ludekens, and later Bernie Fuchs and Bob Peak performed a consulting role. Records show that at least 160 illustrators have lived and worked here. In the 1940s an influx of cartoonists from the Disney Studios migrated here, as did other illustrators from Chicago, Detroit and Cleveland. Later, the Famous Artists School brought a group of young artists to act as instructors. Westport was also the home of Walt Reed, founder of the modern discipline of illustration art history. Unlike other public libraries, the Westport Public Library offered massive filing cabinets of reference pictures for illustrators and cartoonists to use in their assignments. 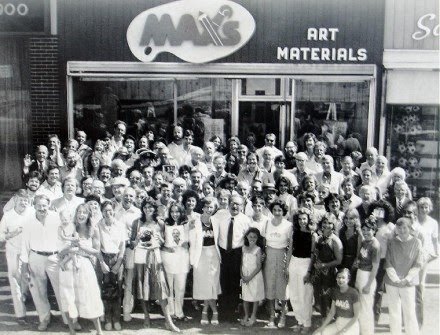 And of course Westport also had Max's Art Supplies, the local art shop that sold the raw materials for those fabulous pictures, beginning in 1956. The creative energy and talent that these artists and their peers poured into thousands of pictures for all the top accounts was truly astounding-- the challenges, the craftsmanship, the fierce competitions, the innovations. This was a remarkable site. And now the moving finger, having writ, moves on. When Bernie Fuchs died in 2009 I was contacted by a young reporter working for the Westport newspaper, looking for background information for an obituary. As I described Bernie's era the reporter said, "Oh, yeah... I remember now. Somebody once said that some artists lived around here." 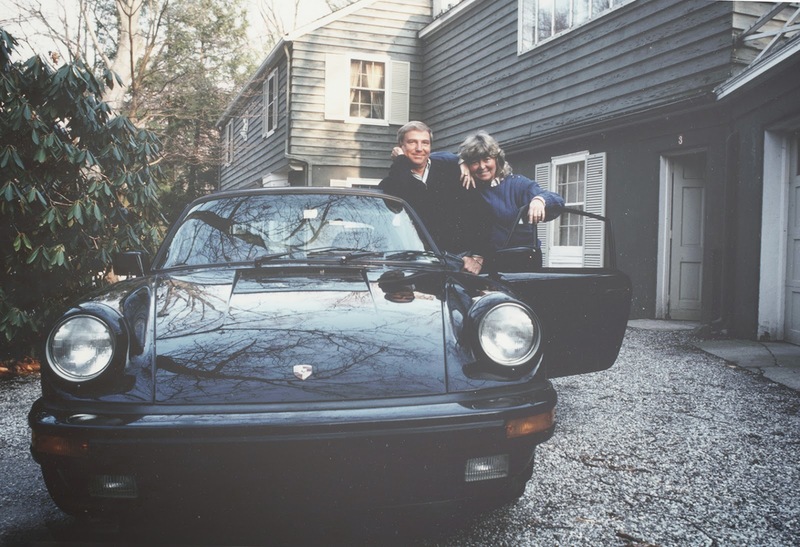 In the salad days: Fuchs with Porsche, beautiful wife and large home with studio. 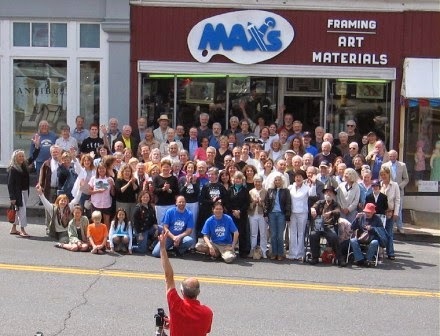 And today we received the word that Max's Art Supplies is closing for good. A very sad day, David. One could objectively point to many reasons why Westport became the place to be. But eventually, a critical mass became self-causal: that's where everybody was. I've been trying to find the earliest colonizers. It turns out NOT to have been George Wright and Sherwood Anderson's brother Karl Anderson in the early 1910s. There was a Puck cartoonist named Gallaway who died in Westport in 1911, so it might go much further back than we tend to think. In the 1920s, two of the wealthiest artists in the world lived there: Held and O'Neill. Sure the guys were in the majority, but there were probably more women artists there than anywhere else, too, even Carmel. Last thought: it's OK to cheat a little bit and include Wilton, Silvermine, and Ridgefield (Fawcett and Sendak) -- it was all one community. I think Howard's count is too low. Can't say I was familiar with Max's, but if it can happen to Manny's Music then all bets are off. Westport got artists by being close to New York City publishing and a beautiful place to live. In the future it will be remembered for its artists. They should make the studios historic monuments. And then there were the micro-colonies such as Arlington, Vermont's crowd -- the Terrific Trio of John Atherton, Meade Schaeffer, and Himself, Norman Rockwell (whose works can auction at eight digit sums). Anonymous / Roger Reed-- Roger, your background and erudition were unmistakeable, even if you hadn't returned to identify yourself. I agree that the process became self-causal after a while. So much of art-making is a solitary process, it must have been rewarding to live in a community where artists could compare notes with each other. One hears multiple stories about artists in small town America in the 50's whose ambition was to "make it to Westport," that mythological place where all the children were above average. Etc, etc-- Yes, the fall of Manny's Music was another tocsin for the demise of something important, and a cue for us to look around and take note of what we have lost and what is replacing it. There was a music store in Westport as well (although nothing could compare with Manny's) and several of the great illustrators were serious musicians on the side. Someone wrote me privately that "it shouldn't be forgotten that Westport was at least as important in the theatre and music worlds.... There was a serious summer theatre, and a number of famous actors lived in Westport." They reminded me that F.Scott Fitzgerald and J.D. Salinger also lived in Westport, and likened it to "Paris in the 20's." MORAN-- Yes, some of those studios are haunted up there. But I fear that many of them have been transformed or demolished by new, wealthier occupants. Donald Pittenger-- Very true. Old Lyme was another such micro-colony, although none of them seemed to have the critical mass or staying power of Westport. Remember, Himself spent part of his career in New Rochelle, a few stops before Westport on the commuter train. History records more than one trip where Rockwell and Dorne shared that train ride together. And the hotspot now is in LA, right? Or was it San Diego? Yes, Rockwell, after leaving New York City itself, spent a good deal of time in New Rochelle, where the Leyendecker brothers were based. Another micro-colony? Years ago when I was doing my back-and-forths between NYC and New Rochelle (Ft. Slocum), I usually rode the New Haven line's Stamford Local that didn't go as far as Westport. I suppose Rockwell took whichever train suited his schedule. And apologies for not naming Schaffer "Mead." Maybe that's because I spent a chunk of my army days at Ft. Meade, MD working at the public relation office and can't get that final "e" out of my mind.. The internet is changing this. Illustrators don't need to be where other illustrators are. They can stay in the woods and share their ideas. >>"Illustrators don't need to be where other illustrators are. They can stay in the woods and share their ideas." But something is lost, obviously. Donald Pittenger-- I think Ft. Meade could use your public relations skills right now, given the battering that the NSA is taking on capitol hill. JSL and Richard-- I am second to none in my respect for the transformative power of the internet but I agree with Richard, it's not the same. Artists gain plenty from digital tools (for one thing, no one will ever have to go to the Westport Public Library to find reference images again) but you lose a lot of bisociative thinking when you don't have a warm blooded human being in front of you with a drink in his or her hand (especially when the rest of the world is asleep). Pearl Paint on Canal Street, NYC closed in April. The internet is advantageous, but also strange. In the last 12 years I've spoken to an art director face to face just once and that was 10 years ago. Recently I took a tally and noticed that I've spent far more on computers and programs than the $1,000 a year I used to spend on art supplies. Pearl's pricing just wasn't competitive at all; I used to jokingly refer to it as "the Pearl of great price". Still sad to see it go, though. HELLO DAVID, CAN YOU PLEASE GIVE THE READERS AN UPDATE ON THE FORTHCOMING BOOK ON BERNIE? hello friend, okay? really liked your blog, you are a great art collector,,, you have pictures of a French cartoonist named Mulatier?? him and a great cartoonist, best in the world ..
but it is very difficult to find pictures of his caricatures ... if you have sent me email, please ..
Luciano araujo-- Thanks for writing. I had no problem googling Mulatier. He does some nice work. The great Harry Anderson should be on the list -- he actually bought Fawcett's house and studio. Steve Rude, who idolized Harry, and I visited him in '88 or '89. Gracious, humble guy. Comparing the storefronts from 1981 and 2006, it's telling that "FRAMING" was added above "ART MATERIALS" during the interim. Perhaps, over time, they had to cater more heavily to art-consumers, to compensate for a dwindling market of art-creators. Paul Chadwick-- I had no idea that Harry Anderson bought Fawcett's house and studio. Add that to a number of other Westport studios that were handed down from one generation of great illustrators to another. Then finally there came a day when Bernie Fuchs' home and studio were bought by Martha Stewart. I envy your visit with Anderson. He was really a superb painter. It's nice to hear he was a good person too. Jesse Hamm-- Very observant. I watched a video interview with the owner and she said that the framing business kept them alive in later years.